Skip the Queue: guided tour of the Prado Museum! A Tour of the Prado Museum is the best way to visit this famous attraction, skip the queue at the entrance in the company of a local guide. As one of the world's most prestigious museums containing more than 9,000 works of art in its collection which includes paintings, sculptures, prints and drawings, the perfect visit includes "skip the queue" at the entrance and benefitting from the knowledge of an experienced guide which will enable you to move around the museum with ease and without having to worry about missing out on seeing any of the most important works of art. 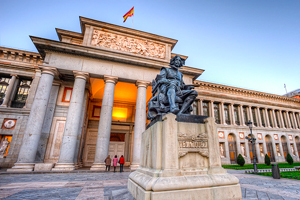 The National Museum of the Prado is one of the most important art galleries in the world. This visit to the Museum is organised in such a way as to allow the participants to find out about the works of art in chronological order. The Tour begins in the room in which two masterpieces by the artist Hieronymus Bosch are exhibited. He is known as "El Bosco" in Spanish. You will be able to admire the following works: The Table of the Seven Deadly Sins, The Haywain and The Temptation of St. Anthony. There is also The Extraction of the Stone of Madness and The Garden of Earthly Delights. The Tour then continues through the galleries that are dedicated to El Greco, the nickname of Domínikos Theotokópoulos (1540-1614), with a special focus on the following works: The Gentleman with his Hand on his Chest, The Holy Trinity, Christ on the Cross and The Annunciation. Following on from this, you can view works by Velázquez (1599-1660): The Adoration of the Magi, The Triumph of Bacchus, the Equestrian Portraits, Vulcan's Forge, Christ, The Spinners, The Surrender of Breda and Las Meninas And last but by no means least, the works of Francisco Goya (1746-1828): The Second of May, the portraits, the family of Carlos IV and the Black Paintings. The Tour lasts about one and a half hours and at the end, visitors can continue exploring the museum for as long as they wish becase the entrance tickets are valid for a whole day. By booking a Tour of the Prado, you can rely on the expertise of a professional tourist guide who will undoubtedly enrich your experience inside one of the most prestigious museums in the world. Upon receipt of payment, you will receive an email with the receipt attached which you can print and then show on the day of your visit.